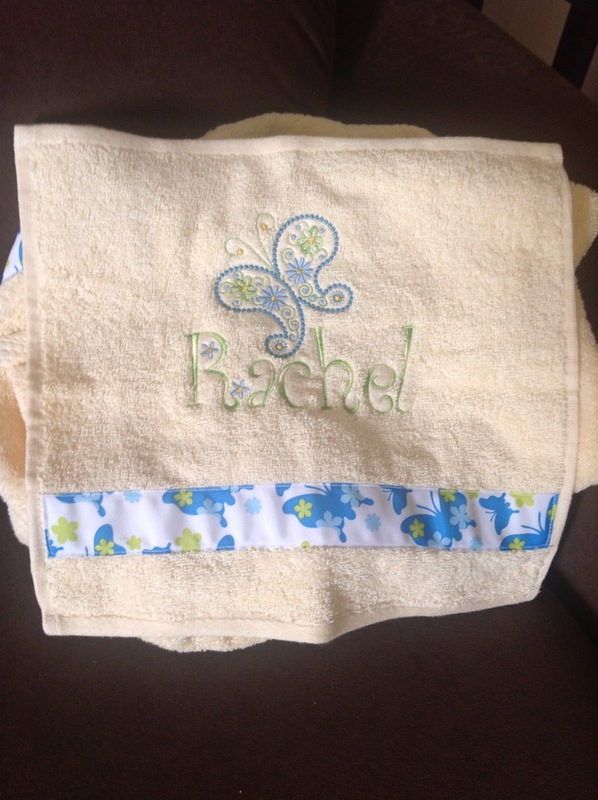 I think I've written about the towels I make for babies before. This one is for a sweet little girl that will be born tomorrow. I LOVE the colors and the butterflies. I've been pretty busy, but I've had time to learn to knit and carry it around when I'm taking the kids places or over see homework. 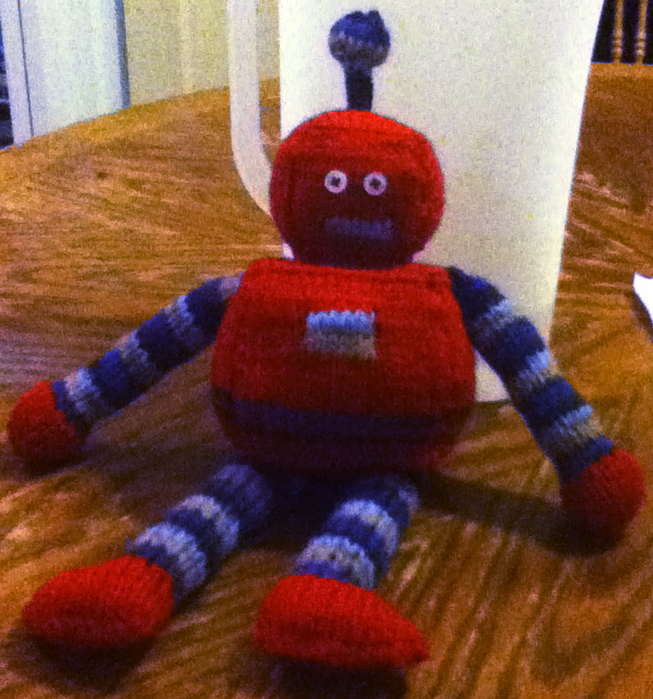 I made this little guy for Seth for Christmas. He loves it and has named it Roby (with some help from his oldest sister). I've done a lot since my last post. Mostly knitting, cause it's portable and since we spend a lot of time waiting for our kids at their activities, it gives me something to do. I have a tendency to start projects and then I get side tracked by other things, so the projects don't get finished. So, I'm making a conscience effort to work on the big projects that I have mulling around so that I can get them done. I've created a sidebar and am scheduling some time on Fridays to work on them. I'll also be using any free time I can muster up to work on them. I'm hoping that things work out for me and I can get these projects done and out of the way. We've had this car seat for several years. Lucy notoriously ripped some of the stuffing out of the cover and stuck it up her nose. The backing on the car seat was really thin, easily destroyed stuff. I decided before we let Seth use this seat that a new cover would be made, making it nearly impossible for Seth to do the same thing. I used leftovers from the boy's quilts. I'm trying really hard to use materials that I already have on hand, so it has a lot of personality. Seth loves his new car seat. I love that the cover is so much sturdier than the old one. I disappeared for a while. I got too focused on getting the quilts done and my family needed some time. I have been working on the quilts, don't worry, just not taking the time to post about it. I'm working on getting Seth's marked and then I will baste it. That pretty much needs to happen today because today may be the last time the weather will be good enough for me to use the spray adhesive outside. Just the black thing, not the sewing machine. What does it do? Well it helps me move my quilt around more easily so that I can machine quilt it faster. Jamie and I played around with it a little tonight and though we are pretty novice at using it, we did a lot of quilting in a very short amount of time. It's not the best looking little quilt. The cloth and batting was just stuff I had lying around. The stitches in white show up a lot better, but there are some in black on the left. The bananas are to give you a reference. I'd say that we covered more than half of the area and did it in less than 15 minutes. The stitches are much smoother and I could let the machine sew much faster than with just my machine. Jamie's contribution. I think he did really well. I'm so excited. Now, I just need to get those two quilts ready to start quilting, but I also need some sleep. Slow steady progress is just the thing, right? And I'm not an elephant. I forgot to take some pictures of the details of Abby's quilt. And, I forgot to write a post yesterday. 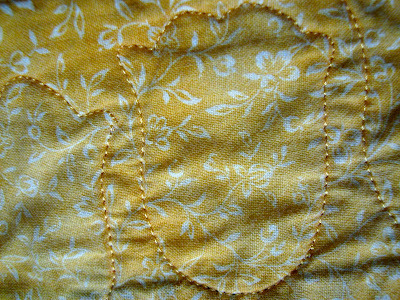 And here are some close-ups of the stitches (and yes it was my first quilt done on a machine, so I'm really embarrassing myself here, don't look too close). Stripes stitching to help it look more like grass. Just another layer to really personalize the quilt.